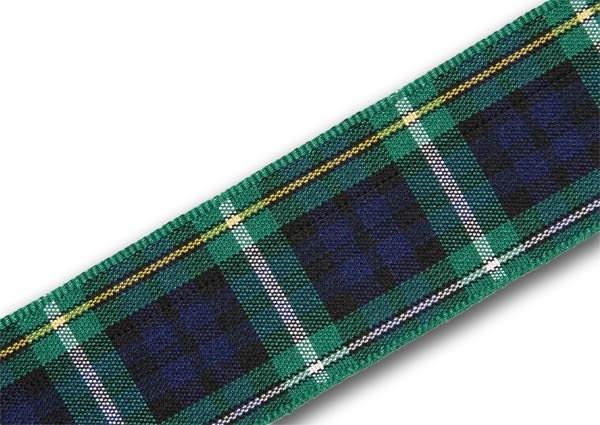 This Campbell Tartan Ribbon is the modern variant of the Campbell of Argyll tartan, the most popular of the Campbell tartans. The dark green and blue undercheck is the Government or Black Watch with a single white and gold overcheck. Both the Argyll and Sutherland Highlanders, (a regiment raised by and drawn from Campbells) wear the Government Tartan. The tartan is often referred to as both "Campbell" and "Sutherland" because it was the tartan of The Campbells ( who were staunchly loyal to the British crown), that the new Government Tartan was based after the Jacobite rebellion of 1745. Most military tartans since were/ are based on the Government Tartan with different coloured overchecks to denote various regiments e.g. a white overcheck for the the Douglas of the Cameronians (Scottish Rifles and a gold overcheck for the Gordon Highlanders to name a few. Sold by the metre with special pricing for larger quantities available, this ribbon is available in 5 different widths. As with all our ribbon, it is is a top quality, authentic Scottish tartan ribbon as certified by the Scottish Tartans Authority that we import from Scotland.